This little safe works as it is advertised. The battery operated lock works well, and there is a key override system if the batteries fail. It is an easy way to keep secure passports, cash, jewelry, or other small documents. This safe is just what the ad says-it is a safe. It is meant to be secure and it is. 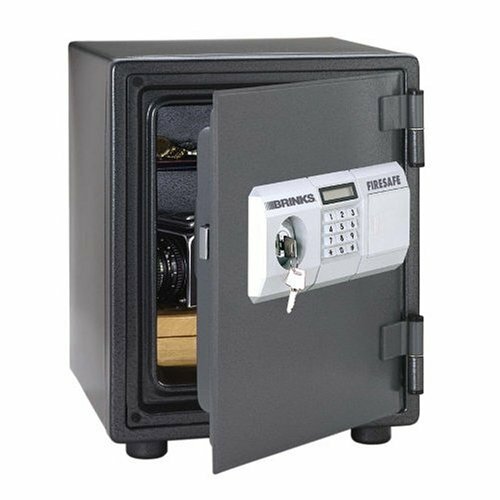 Documents that are important should be in this safe. I feel it would be better used lying down just because that way nothing will fall out at you when you open it up. It is very heavy duty and the ability to set your own code should make it easy to remember. 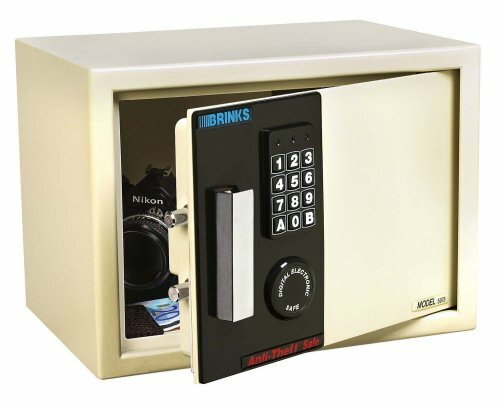 I was looking for a small, digital-combo safe like this to mount onto (or into) a wall, and the Amazon review implies that the 5074 is mountable "to studs". The Gold Box price was too good to pass up, so I bought it. The Good: It works. The paint finish is nice. The Bad: It's definitely for mounting FLAT, as in a drawer. If you want wall- or shelf mounting, you'd naturally want the hinge at the top, so the keypad reads right. BUT, the hinges won't hold the door open that way, and the inside shelf would run vertically instead of horizontally! Your only choice is to mount it sideways, which means the keypad is sideways, too. Not the most ergonomic arrangement, especially if you need to open it in a hurry. Besides that, the batteries were already dead on arrival, and the bolt handle squeaked and grated. I'm surprised it's in as good of shape as it was when it arrived. The box was totally beat to death and I dreaded sending it back because of it's weight. But, it was relatively unscathed. It's a great little investment, except for the hinges. You'd think they would have something more durable, than those flimsy little hinges held together by a rivet. One of the hinges is impossibly loose and impossible to repair. We mounted it on the wall and so far so good. I got it on a gold box sale so with the free shipping it was worth the price. I needed a fireproof file case for home use, to protect important documents such as insurance papers, titles, etc. After visits to several local stores and some on-line research, it is clear there is a large gap between professional equipment (two or more hours of protection, $500+ and hundreds of pounds) and home equipment (30 to 60 minutes protection, about $100 and 100 pounds or less). The major competitor to this Brinks is a Sentry product. 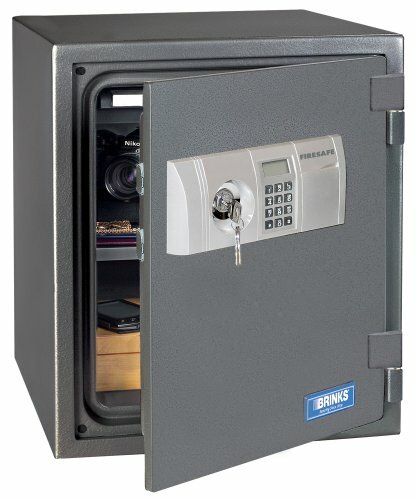 Both are rated for 1/2 hour fire protection at 1500-1600 degrees, but the Brinks is also waterproof for hours when completely submerged (what is the first thing the fire department is going to do when the arrive at your burning home?) As well, the design of the Sentry products in this price/size/protection range left a substantial gap between the cover and body of the case. Finally, the Brinks came with a removable caster system which makes it easy to move around (it's about 40 pounds). The down side is that it's rated for only 30 minutes. Sentry makes a case rated for one hour, with a larger internal size, but it weighed 100 pounds and had no handles. I could barely move it, but it was waterproof and better constructed than their 30 minute case, so it might fit your needs closer than mine. 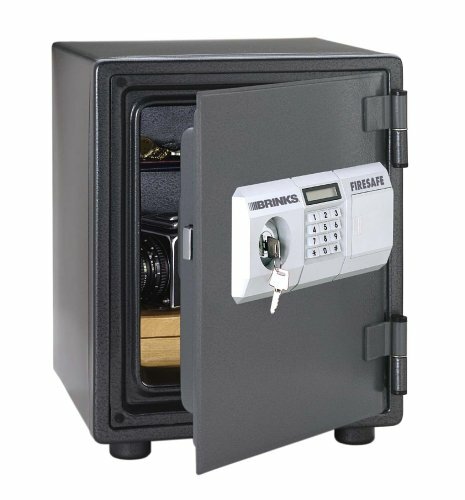 Both companies make several safes rated for one hour. These are harder still to move, and may be a target for thieves; I did not get one since I was interested in protecting files and not valuables. If you are interested in professional level protection, include the brand "FireKing" in your search. 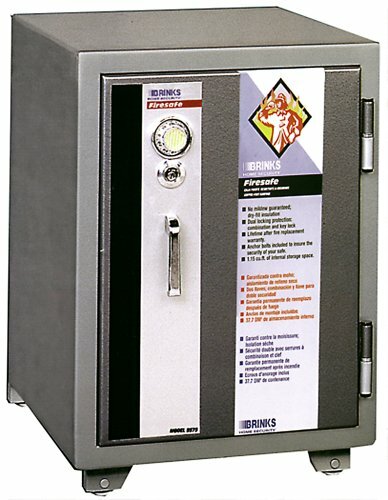 I just bought the Brinks 5017 waterproof fire safe two days ago. Today it's being returned. 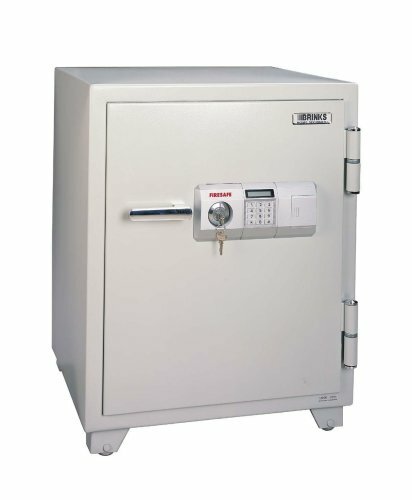 I think to be called a safe, it should be a lot more secure. 1) There are two anchor tabs on the safe & lid designed to allow it to be secured to a permanent object with lock & cable (not included). However, these tabs are the same plastic as the housing, and you could probably cut through them with heavy scissors. 2) The locking mechanism is not convincing; components, while steel, are still a little flimsy, and something I'd expect to find on a mailbox. It gives slightly under hand pressure, and I moved some of the components with my fingers when it's in the open position. I believe it could be compromised with crowbar & sledge. Despite the cons, I'm still glad I bought this. Now I have a central place to keep documents; it protects me as much against misplacing things as against possible fire. That it's waterproof was an added bonus, since water usually follows fire. But it's only certified not to leak when submerged in 13" of water for up to 8 hours. I guess that's enough, just don't drop it in the lake. Yet, the rubber waterproof seal is relatively exposed, and I wonder if it retains its efficacy AFTER being subjected to extreme heat. Nowhere does the product explicity claim that it can do both in the same day. Fire: 1550 F (850 C) for 30 minutes. 5-year limited warranty, lifetime after-fire replacement guarantee. UL listed for fire but not water. Paper burns at 451 F, by the way. The chemical smell? It's pretty faint, not really an issue. Smells more like the inside of a tire than fishy, and that is a pleasant smell to me. So, this is a satisfying baseline option for simple needs. I felt ok paying $30 with free super-saver shipping. I'm sure it will last a long time, though I hope it doesn't get stolen; most people don't have steel beams in their bedrooms onto which to permanently fasten their safes. 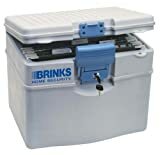 I'd recommend Brinks strengthens the lock mechanism and rethinks the anchor tabs. Actual internal dimensions are 13.25 x 8 9/16 x 3.5 inches (335 x 215 x 75mm). Exterior: 16 1/8 x 12.5 x 5 5/8 inches (410 x 320 x 145mm). Weight: 23 lbs (9.5kg). I found this safe to be more substantial than I imagined and while there is a slight peculiar odor, it's certainly not as bad as the other reviews led me to believe. I'm happy with it and think it's a bargain at the price. What I didn't like is it's made in China, but what isn't now-a-days? I just caught a reference to the same smell 'fishy' chemical odor I've sensed from mine but I bought a much larger one, Model 5058D, which has a heavy paint/solvent smell that hasn't diminished after days of airing it out with the aid of a fan. I'm almost bowled over when I open it after an evening with the door closed so I'm very hesitant to put anything other than paperwork and even would wrap that in a plastic bag. I'm going to return it to Fry's Electronics. Luckily it's only 70 lbs heavy.